These are hard times for Catholics. For some, living in a few parts of the world, these are martyrisation times. They are posed in face of a question whose answer is easy to pick, “Say Yes to Jesus”, but terribly hard to implement: it's the matter of their lives. 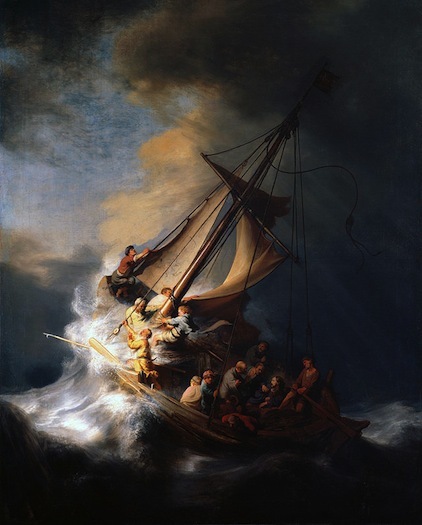 Others like us, living in safe countries, don't have their life at stake, but guessing the right answer day by day needs some great discernment: how to be a witness of Jesus in all the aspect of our lives, immersed in a world that is screaming against Him; being on a boat that it's being literally shaken by the storm and - what's even worse - that we don't know how firmly is managed. A: The faithful should take courage, because the Lord will never abandon his Church. We should think about how the Lord calmed the sea in the storm and his words to his disciples: “Why are you afraid, you men of little faith?” (Mt. 8:26). If this time of confusion seems to put their faith at risk, they have to only work even harder to live a life that is truly Catholic. But I am aware that to live in these times is a source of great suffering. Q. It's hard not to think of a punishment. A. I think so first of all for myself. If I'm suffering now for the state of the Church, I think that the Lord is telling me that I need a purification. And I also think that, if this pain is so common, this means that there's a purification that the whole Church needs. But this doesn't depend on a God who only wants to punish us, it depends on our sins. If in some way we betrayed the doctrine, the moral or the liturgy, unavoidably a purifying pain follows to bring us back to the narrow road.